With the warm weather approaching, it is time to start thinking about how you can upgrade your pool! Spring is finally here and that means the warm weather is approaching! That means that soon, you’ll be able to swim in your pool again. What better way to have a great summer than to upgrade your pool this year? 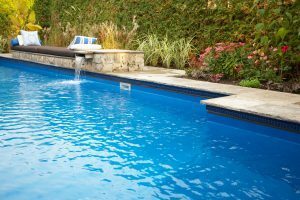 Here are four ways you can upgrade your pool! If you want to really make your pool stand out, upgrade your pool with some cool lighting! Lights come in all different colors which allow you to customize your pool and set the mood however you’d like. You can also get more use out of your pool with lighting because it allows you to safely swim even after the sun goes down! A lot of people are merging into salt water systems for their pools. Even though the equipment costs more initially, you are saving a lot of time and money on pool maintenance in the long run. You don’t have to manually add chlorine anymore because the equipment will produce and manage chlorine levels on its own. It is also said that a salt-water pools are a lot less harsh on the skin and eyes than fresh water pools. Modern technology is allowing you to upgrade your pool with equipment that is a lot more energy efficient. This is great because pool equipment runs for a long time and can add quite a bit to your electricity bills each month. One of the most popular options is a pool pump that varies in speed, making it so that it uses a lot less electricity. They also sell energy efficient filters and solar powered heaters or lights. You can go even further with evolving technology and invest in automatic equipment for your pool. This will make maintenance a whole lot easier when you can control your pool equipment with a remote, rather than having to do it manually. You can invest in automatic robot pool cleaners that will do the dirty work for you. They also sell automatic pool covers to make covering your pool as easy as pressing a button. You can even purchase all in one pool automation systems which connect everything to one device, meaning you can control all of your pool equipment from your smart devices! Contact Sunrise Premier Pool Builders Today! This entry was posted on Friday, March 23rd, 2018 at 12:01 pm. Both comments and pings are currently closed.